UNSCENTED CASTILE is a mild formula free of essential oils and fragrance. Great for people with allergies or sensitive skin. Of course, it is great for babies as well delivering a natural, fresh clean. CERTIFIED ORGANIC AND VEGAN INGREDIENTS. No Synthetic detergents, no foaming agents, no chemicals, and no animal products - only pure, fully-biodegradable plant oils transformed into soap. PACKED FULL OF ANTIOXIDANTS, VITAMINS, MINERALS. AND OMEGA FATTY ACIDS. Yes that's right by adding Argan, Hemp, Olive and Jojoba oils as well as glycerin together these ingredients work to repair and illuminate your complexion. SO MANY USES. One soap, a variety of purposes - from head-to-toe body care, household cleaning, laundry and even pet care. Use it as a body wash, hand soaps, shampoo, face wash, facial cleanser, shaving cream, baby wash, pet shampoo, dish soap, laundry detergent, kitchen and bathroom surface cleaner, bathtub and tile scrub, window cleaner, degreaser, antifungal plant spray, and more. You'll find all our favorite recipes on the bottle. 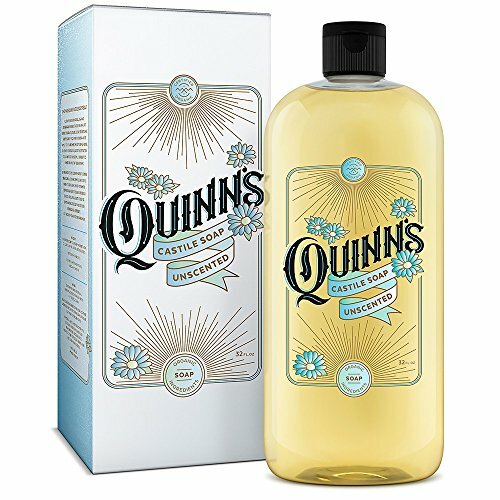 If you have any questions about this product by Quinn's, contact us by completing and submitting the form below. If you are looking for a specif part number, please include it with your message.